CAN YOU SPARE A MINUTE FOR WILDCARD MASK.. LEARN SUBNETTING BEAST IN 5 MINUTES!!!!! You think Subnetting is a beast? You think you have to be Superbrain to understand it? The very last IP of each Subnet is called Broadcast-Address. its NOT useable for host-pcs. So in this example, BEFORE we had one big Network. it in two smaller networks. 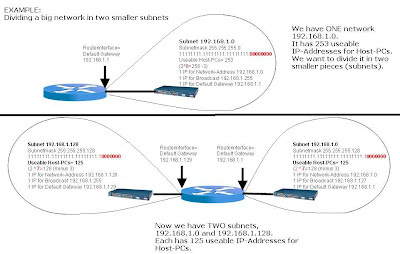 The Subnetmask defines how big the subnet is. called "octett".Because - each Block has 8 bits. Lets take the first block. The first "1" stands for a 128. The second "1" stands for a 64. The third "1" stands for a 32. The fourth "1" stands for a 16. The fifth "1" stands for a 8. "create a subnet with minimum 10 host IPs"
2^4=16 That is higher than 10. Good. 2. Now put the LAST 4 Bits of your subnetmask to 0.
in the Subnet,without wasting to much IP-Addresses. 2^7=128. Thats higher than 70. Good. 2. Put the LAST 7 Bits of your Subnetmask to 0. You have a Subnetmask, with more than 70 Host-IPs. The LAST of the 1s is under decimal 16. That are our "network jumps"
Subnet starts = the BroadcastAddress. The LAST 1 stands under the 64. That are in that example our "net-jumps". The very first IP is reserved for Default Gateway! What is the first and last valid IP for a Host-PC? The LAST 1 is under the 32.
last IP and so the BROADCAST-IP). subnets with 500 usable host addresses per subnet? Allways the same game... Like in 5 minute course..
Power of 2 that is minimum 500? Now - put the last 9 Bits of your Subnetmask to "0"
The last of the ones stands under the "4". That is our increment or network jump. host addresses on the subnet 192.168.15.19/28? Only A and C are IPs in the right range. Also E is in the right range. So answer is A and C.
For wildcard-mask only the ZEROS are interesting. now, we have to bind that access-list to a routerinterface. In the example, this is e0. to calculate Subnets in your head in a half second! Memory Usage Labs can consume a large amount of real and virtual memory. The “ghostios” and “sparemem” options were added to address both of these issues, respectively. The Ghostios option can significantly reduce the amount of real host RAM needed for labs with multiple routers running the same IOS image. With this feature, instead of each virtual router storing an identical copy of IOS in its virtual RAM, the host will allocate one shared region of memory that they will all utilize. So for example, if you are running 10 routers all with the same IOS image, and that image is 60 MB in size you will save 9*60 = 540 MB of real RAM when running your lab. Ghostios is enabled, by default, in GNS3. The “sparsemem” feature does not conserve real memory, but instead reduces the amount of virtual memory used by your router instances. This can be important, because your OS limits a single process to 2 GB of virtual memory on 32-bit Windows, and 3 GB on 32-bit Linux. Enabling sparsemem only allocates virtual memory on the host that is actually used by the IOS in that router instance, rather than the entire amount of RAM configured. This can allow you to run more instances. Both features rely on mmap, so this must also be enabled. Select Preferences under the Edit menu within GNS3. Check the appropriate boxes to enable these features. now this could be trouble some , in order to bring down the cpu usage you need to calculate idlepc value ..
after you are done with the configuration part ..
the reason behind this is simple .. simulators are programmed by a programmer who inputs maximum number of commands he knows .. he cannot put a cisco ios in the simulator... so most of the commands wont work for real life on a sim .. The following would be my study plan for the rest of bsci course ... i will be posting all the info regarding that .. so be in touch and post any problems you are facing regarding any thing i would be more than happy to help you ..